I love the venue chosen by PPDJB this year. All these while, the teacher's day celebrations were held at school halls. A change is definitely good this time. The event management was smooth-sailing and I would like to congratulate them for pulling this off successfully. A speech from Tn. Hj. Bahrom Ali, PPDJB Officer. The choir was spectacular! 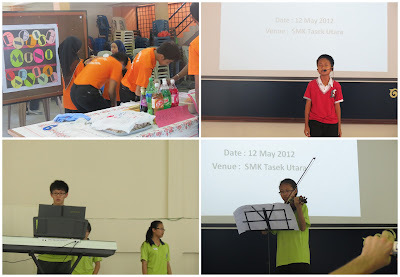 I think that the teachers performed really well and everyone enjoyed the musical ensemble. Kudos to Pn. Yeow, the conductor who is a GC from SK BBU2. SMK Tasek Utara won three awards that day. First for Innovative Teacher Award, next is rep for State Teacher's Debating Team and last but not least, Active Teacher Award. Congrats Ali and Pn. Lim! You are the best! I am awarded Johor Bahru's Innovative Teacher Award again this year. For me, every teacher has many ideas and wonderful ways of teaching in classroom and it would be even better if the ideas and experience are shared with others. Alhamdulillah, I perceive it as an encouragement for me to strive better in my future undertakings. Met my TESL junior, Afidah. She's a bubbly and jovial person who is currently teaching at SMK Aminuddin Baki. We first met when we were judging the district level debate competition. It was certainly nice meeting you again :) I'm a bit sadden that this would be my last Teacher's Day as a Tasek teacher for I would be studying full time at UTM this September. Nonetheless, I am proud to be a Tasek teacher as my school has paved many ways for me to improve myself and to meet wonderful teachers and students who made my life colourful and wonderful. 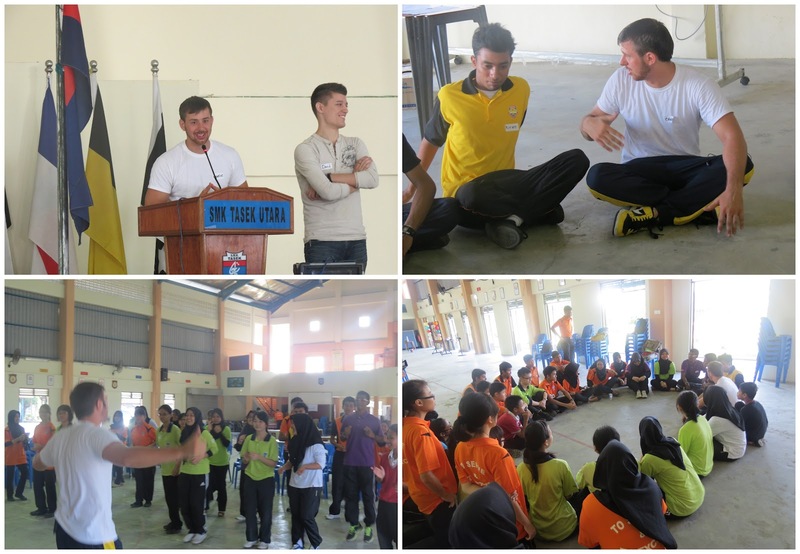 Awesome workshops conducted by the two guys. Students learn more on American culture and share their experiences with Charlie & David. I'm so blessed that I managed to rope them in. It wasn't an easy task but alhamdulillah, things turned out well eventually. My talented students. This event is mainly organised by the Student Leaders Board with facilitation from the English Language teachers. My students set up games and photo booths, carnival style :) I'm so proud of their efforts. Good job everyone! The participants and the committee members. I'm so glad to hear that Charlie & David had a whale of a time being with my students. Thanks for sharing your ideas and experience with us. 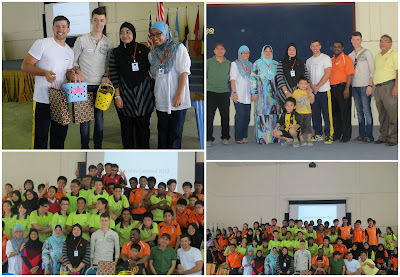 My students were so excited and I can see they are more confident in speaking English now, thanks to this event. 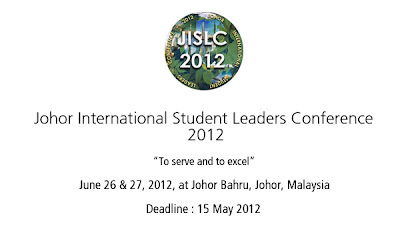 The aim of JISLC 2012 is to encourage student leaders from schools (age 13-18) throughout Asia and beyond to meet and exchange ideas, views, initiatives, and visions on an international platform; engaging in a cross-cultural learning environment. The 1st Johor International Student Leaders Conference 2011. 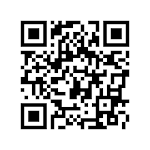 Don't miss the golden opportunity this time! To register as a participant or a presenter, check out this link and download the forms enclosed at the bottom of the webpage. If you are interested to be a paper presenter, please send the abstract of your paper presentation and we'll review them. 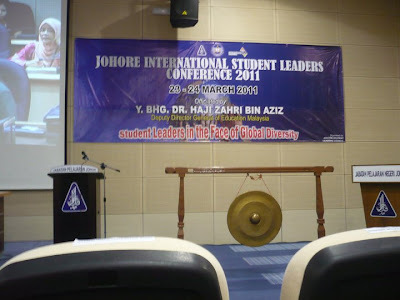 Grab this golden opportunity to discover new things, hone your leadership skills and meet awesome new friends at the 2nd Johor International Student Leaders Conference. For more information, please visit the official JISLC 2012's website. Hope to see you there!